that is just too cute, love the tiny panda!! I love your little bears, but the baggie and blanky make it look even more cuddly! How cute is that???? I always love your little details. I wish my name was Gracie and it was my birthday! How sweet! Happy birthday, Grace! The birthday gifts are so sweet. How could she NOT like it? What a sweet little set. I have some of the red floral fabric, isn't it great? This is so sweet and cute, my heart is melting. Aaaawww. So cute and sweet. I wants me one! i wish i was gracie! You, m'dear, are going to kill me with the cuteness! Why thank you...I'm so excited oh there's another girl out there called Grace? :( Well if she is anything like me she is going to love to pieces! lucky her! 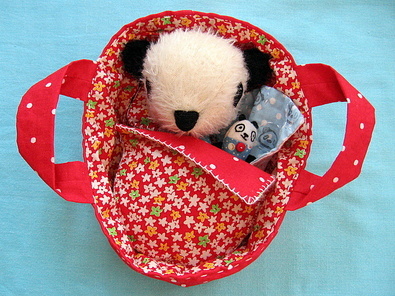 i wish i had a panda like that, SO CUTE! my word, woman, you are one genius soft toy maker. I love what you come up with. very nice. wow! amazing woman softie maker! I love how your toys have toys! The gift is adorable and I'm sure she will love it! How stinkin' cute is this????? Sooooo adorable! I love them. Do you custom make them? Ohh. wonderful!!! What tender!!! It´s very beautiful! The little thumbkin panda? Cutest thing ever! I mean really what's not to like?! I love their little bed. If I were a kid, and woke up on my birthday to find that, I'd be ridiculously happy. =) Happy Birthday Gracie. What little sweeties! Love the red polka dot fabric. Wonderful!!!! Sew cute!!!! I just love it!!!! Oooooh, so homemade and lovely. Very cozy. What a nice present. I love the things that you have made! YOu really are a creative one! They are all cute and are also safe from lead paint..
OMG! This is so so sweet! way too cute for words! Hello there. 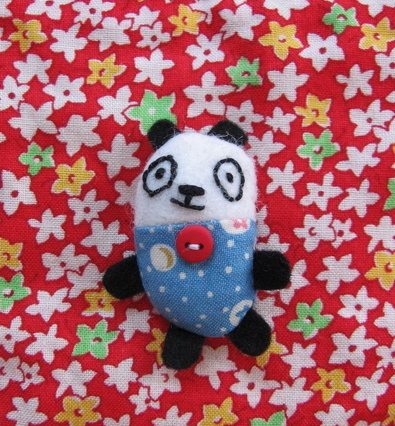 Your tiny little panda inspired me to leap up and sew some of my own! 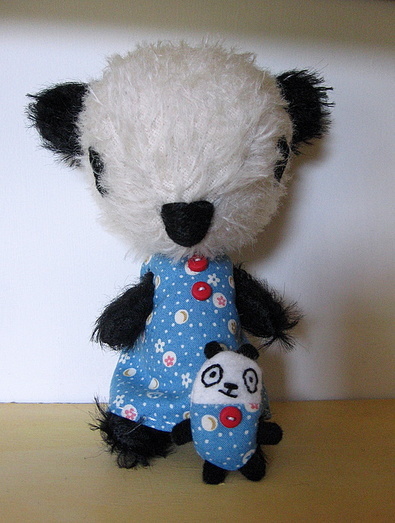 (wouldn't be up to the big panda!) I have only just blogged about them (http://jellybeanlupin.blogspot.com/2007/10/intangible-cultural-heritage.html) and linked back to this page. I hope you don't mind. I find your work so incredibly inspiring and original and am so glad that you keep your blog - thanks. I hope your Mum is getting betterer and betterer every day. Oh and Britney and Paris er... rock!!! First time here ! !I love your sense of humor !! It's so refreshingly real. I love this very mutch !!!!!! !